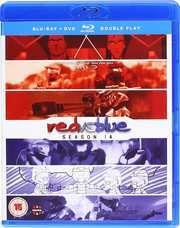 For a few years, you could only get Red vs. Blue Season 13 as part of the Chorus Trilogy Blu-ray. But now that Manga are releasing Rooster Teeth productions again in the UK, they’ve gone back and re-released Season 13 as standalone Blu-rays, and for the first time DVD as well. On the same day they released the next instalment of Red vs. Blue, Season 14 as a Blu-ray/DVD combo. You may wonder why no separate releases as for Season 13, but given that Season 14 lasts almost 4 hours plus extra features, I suspect that the DVD is going to be a pixellated afterthought. Naturally I’m reviewing the Blu-ray. The Reds (Sarge, Grif, Simmons and Donut) and Blues (Tucker, Church and Caboose) were fighting a civil war, or so they thought. In reality it was a live-fire simulation for Project Freelancer. And then things got really complicated. What you really need to know is that for the greatest soldiers in the universe, the Reds and Blues ain’t smart, are borderline crazy, and seriously lazy. Season 14 is a collection of 24 short stories featuring the characters, and unlike the Machinima series, with a whole variety of animation styles. 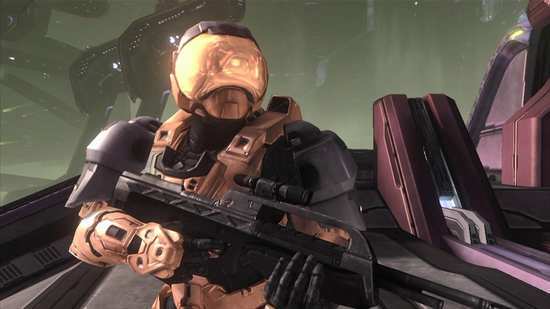 Red vs. Blue gets a 1.78:1 widescreen transfer on this disc, and depending on which short animation you are watching, the format is either 1080i 60Hz, or full 1080p. 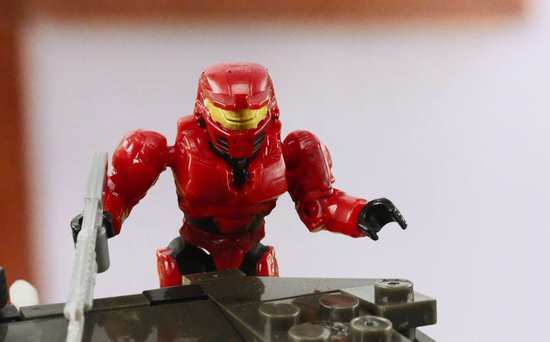 There are a whole host of Machinima pieces here, made with all versions of Halo released to date, but there is some traditional 2D animation, some original 3D animation, live action, and even some Lego stop motion work. It’s a wide variety that you see here, and it all comes across without issue, everything is clear and sharp, colours are strong, and there’s no sign of compression or even banding to my eye, beyond the limitations of the Halo software that is. You get a DD 5.1 Surround audio track, which is a little undercooked for the Blu-ray, but does enough to immerse you in the animations, especially the action heavy ones. The music is typically laconic Red vs. Blue fare, while you’ll once more be thankful for the subtitles, as I still can’t believe Caboose says the things he actually says. The disc autoplays a trailer for Rooster Teeth before booting to an animated menu. You’ll find the traditional Rooster Teeth audio commentary on this disc, with the difference that the commentators switch out depending on which animation is playing. This time the behind the scenes featurettes look at some of the episodes on the disc, and there’s quite a bit of variety in content. 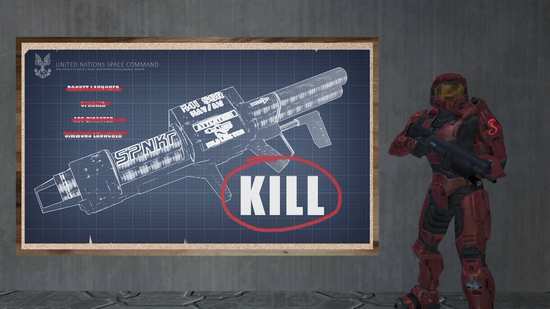 Deus Ex Machinima lasts 6:41 and looks at the Halo originated content. 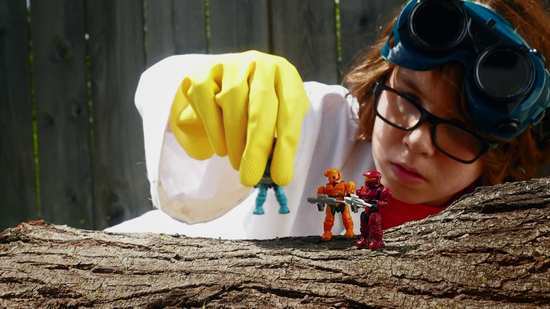 The Building Blocks of RVB lasts 7:03 and goes behind the Lego episode. Making A Mercenary lasts 8:57 and looks at the Felix and Locus story. Immersion BTS lasts 8:00 and goes behind the scenes of the Warthog flip. Rocket Jump BTS lasts 7:03. There is a 0:58 photo gallery slideshow called Red vs. Crew. Finally there are trailers for Camp Camp, Day 5, RWBY 4, Crunch Time, Immersion, Heroes and Halfwits, and Theater Mode. This could have gone either way, and that twice over. 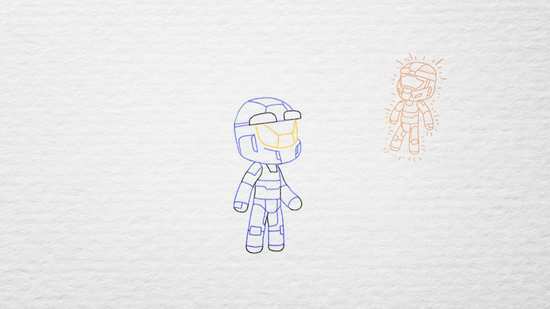 For one thing, after being introduced to the Red vs. Blue universe in the Chorus Trilogy, a story arc that stretched through three seasons, and some nine hours of storytelling, presenting us with a short story anthology format might have been too much of a change. 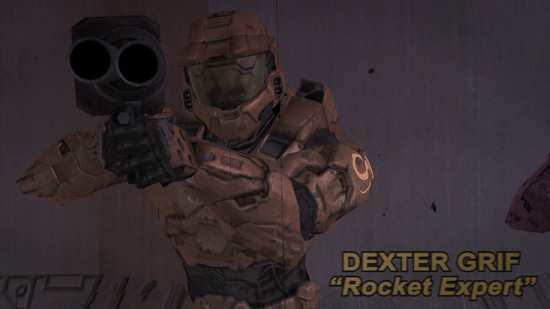 The second thing is that we in the UK (those who haven’t yet discovered RvB on Youtube) will only know the show from Seasons 11-13, and there are 10 seasons, plus various spin-offs that we haven’t had released on home video yet, and many of the short stories in Season 14 make reference to stories and events that we haven’t seen. It could have had the effect of turning me off from much of what happens in this series. When it comes down to it, Red vs. Blue Season 14 had quite the reverse effect. It manages to tell its stories in such a way as to appeal to newcomers to the genre, and get them enthused and determined to seek out the earlier seasons to catch up on all the good stuff that we have missed out on to date. Certainly it has had that effect on me. The obvious jumping on point for UK viewers will be those episodes that tie in with the Chorus trilogy, and to that end, the Club, Call, and Consequences trilogy of episodes is excellent. They tell the story of the villains Locus and Felix before they were villains. A noir story told in 3D CG animation, it’s action packed, witty, and very stylish. Then there are the episodes that work as stand-alones, the opening 2D animation, the Lego Red vs, Blue story, the ‘Oranges’ vs the Blues, the Anti-Blue propaganda film, the Grey vs. Gray alternate universe story, the musical episode, the Reservoir Dogs episode, and the rap battle. You don’t need prior knowledge to enjoy these stories. 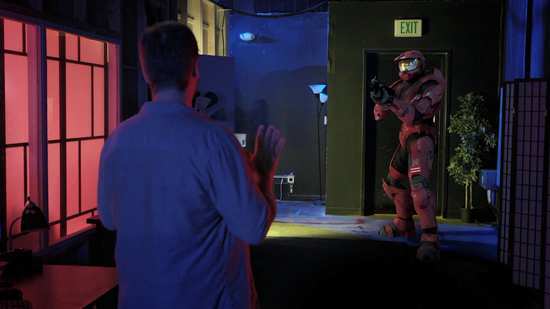 Things get out of the usual comfort zone as well, as one of the films is a live action movie trailer, the Immersion episode steps into the real world for a minute as some geeks with power tools attempt to recreate a Halo move, and things get really meta there at the end, when a teleporter malfunctions, sending the Reds and Caboose into the Rooster Teeth studios to meet their creators. 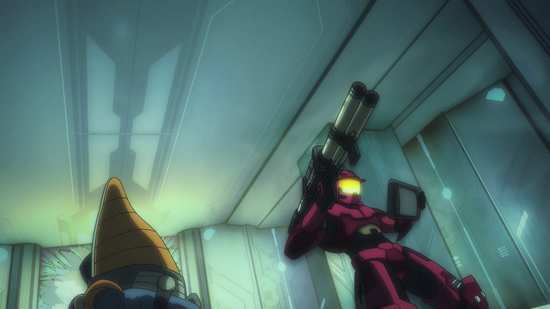 With all this fun to be had, you don’t mind those episodes so much which rely on prior knowledge, even if the disc does kick off with a prequel trilogy that shows how the Reds and Blues were recruited in the first place for their ‘mission’ to Blood Gulch. By the time we’re talking what-if questions about Agent Carolina vs. The Meta, the AI O’Malley body-hopping, Church’s search for Tex, and the lowest ranked of the Freelancers, you’re less out of your depth than you are inspired to find out more about the original stories. That’s mainly because these stories manage to entertain even if you don’t know the back-stories behind them. I was sceptical about Machinima when I first heard of it, and the idea of a comedy told by a group of faceless, almost identical looking characters didn’t appeal to me. 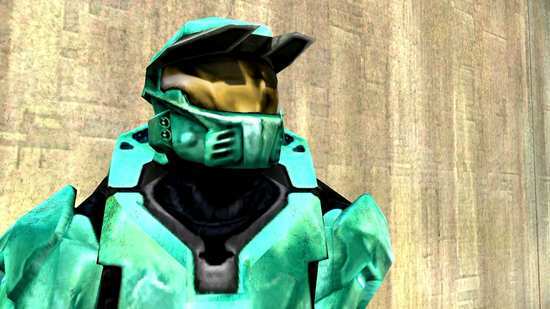 But Red vs. Blue has converted me. There’s a reason why this show has been in production for over 15 years!